427 left in stock, Hurry! If your style is all about catching eyes, the Crystal Splendor Septum Clicker is sure to be a majestic addition to your jewelry collection. 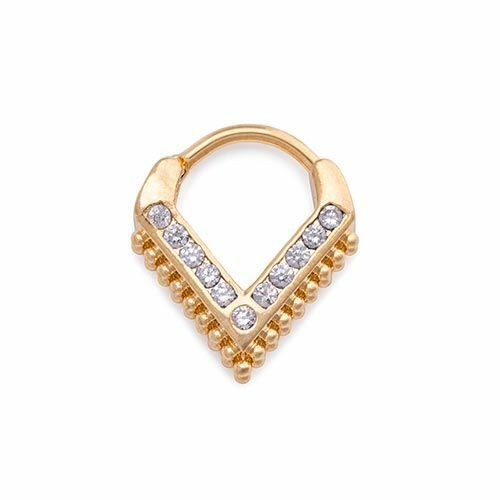 This 16g septum ring is made of brass and gold plated for a lustrous finish; the pin that goes through the piercing is made of stainless steel and has a PVD gold coating. This jewelry also features a series of crystal jewels along the design surface, surmounting two layers of micron beads. This jewelry has an inside large diameter (width) of 8.9mm and an inside small diameter (height/drop) of 9.9mm with a total width of 14.9mm. The clicker mechanism with a hinged closure allows for convenient insertion and removal of the jewelry.